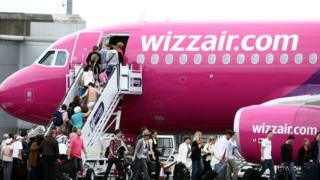 A Hungarian-based airline said it was "committed to the UK market" after applying for an operator's licence. Wizz Air wants to expand at London Luton Airport and employ more than 100 people by the end of 2018. The company applied for a UK flying licence from the Civil Aviation Authority. Chief executive Jozsef Varadi said the move would "bring additional investment and jobs". "The UK remains the single biggest travel market in Europe," said Mr Varadi. "It is a natural next step in the development of our UK business and will bring additional investment and jobs. "This move is also part of our broader strategy to ensure that our UK operations are Brexit-ready." He said the move signalled "our commitment to the important UK market". The company said the 100 jobs would include management, pilots and cabin crew roles at its UK base in Luton. It said the licence would begin in March 2018. The UK is scheduled to leave the European Union on 29 March 2019.